Halloween is my favorite holiday. I love dressing up and taking the kids trick or treating. Last year, I was a nurse infected with Ebola and my husband was a member of the CDC. We got a lot of laughs from fellow trick or treaters. He skipped the makeup, and I used eyeshadow to create black eyes, so it was easy to wash off. Other years, we've done full face paint with different kinds of face paints and glue. Removing the makeup wasn't nearly as fun as putting it on and going out! If you don't want to walk around with a tinted face for a week, try these tips for how to remove Halloween makeup. This is so obvious, but so many people don't think of it first. When you open your makeup, be sure to save the instructions because it should say how to remove it. Don't trust yourself to remember that the red comes off with soap and water but the black needs an oil based removed. You won't remember. Before you can remove the makeup, you need to know what you're dealing with. Removing oil based makeup is very different from removing a water based makeup, and alcohol based makeup is a whole different story. One year we painted the kids with alcohol based paint to airbrush their faces. It looked awesome--until it was time to remove it. In my experience, and my husband does body painting as a side business, the cheaper the paint, the harder it is to remove. It also cracks and peels while you're wearing it, so it doesn't even look good while you're out trick or treating or partying. You don't have to buy the most expensive makeup you see, but generally you get what you pay for when you grab the cheap stuff. 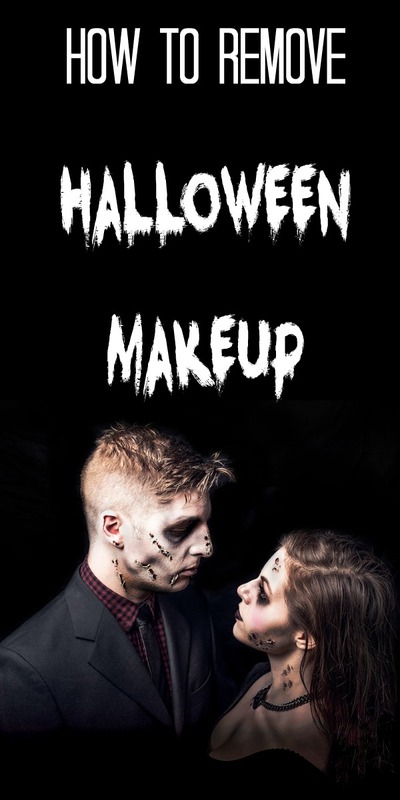 Most Halloween makeup is designed to come off with soap and water. You can use your regular facial cleanser to wash your face. Most of the makeup should come off unless it's oil based. If there is lingering makeup, use a makeup remover to try again. If your makeup is oil based, you'll need to dissolve the oil with another oil. My favorite is coconut oil , but olive oil also works. Place some oil on a cotton ball and wipe the makeup off. If your makeup is heavy, you'll need several cotton balls. If you used Spirit Gum to attach any prosthetic pieces, you'll need an adhesive remover made for the skin. You'll need to apply the adhesive remover several times to get the adhesive off. Soak a cotton ball and hold it on the adhesive to soften it before you start wiping. Coconut oil or olive oil may help remove some of the residue as well. If the makeup stained your skin, shaving cream will usually take off the stains. You can also make a paste with baking soda and water to scrub, but this can dry out your skin. All of that washing and scrubbing can really dry out your skin. When you are done removing all of your makeup, be sure to moisturize your skin with your favorite moisturizer.